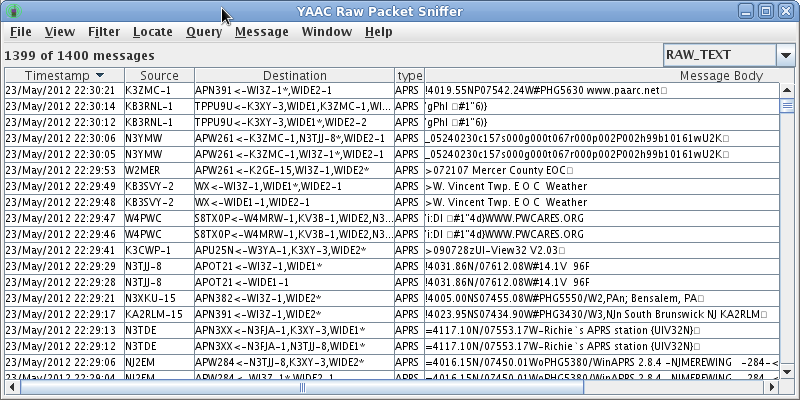 The actual network packets received over the various AX.25 interfaces opened by YAAC can be seen in the Sniffer window. The window displays the date and time when each message was received, the transmitting radio station's callsign, the intended destination and any stations and aliases the packet was relayed through, and the actual content of the message. The data can be sorted in any order by clicking on the column heading you wish to sort by. an ASCII protocol decoding of the message (particularly useful for binary-encoded messages such as compressed and Mic-E format APRS positions, or OpenTRAC messages).